“Your sewer line has a belly”, said your plumber after performing a video inspection of your horizontal sewer line. However, if you ask Pipelining Technologies, we will tell you that 99% of the time, the aforementioned “belly in the sewer line” will turn out to be a misdiagnosis of “channeling”. 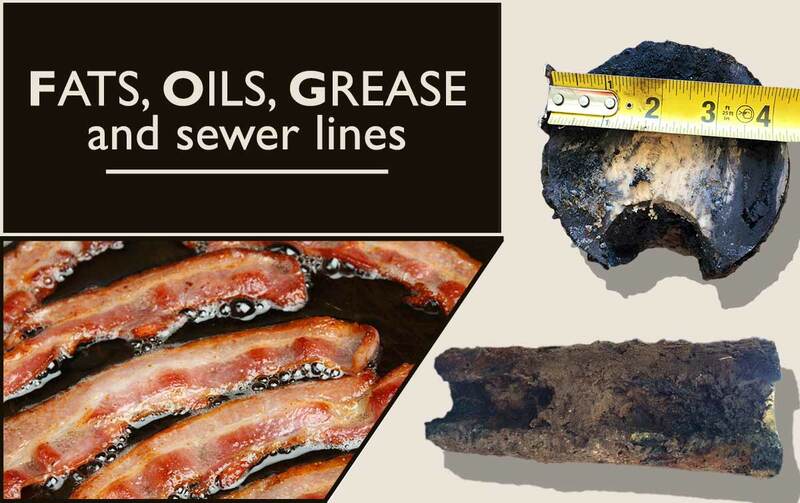 What is a true sewer line belly? What is sewer line channeling? How are these two conditions accurately diagnosed and repaired? Knowing the difference is critical to choosing the most appropriate and cost effective sewer line repair option. 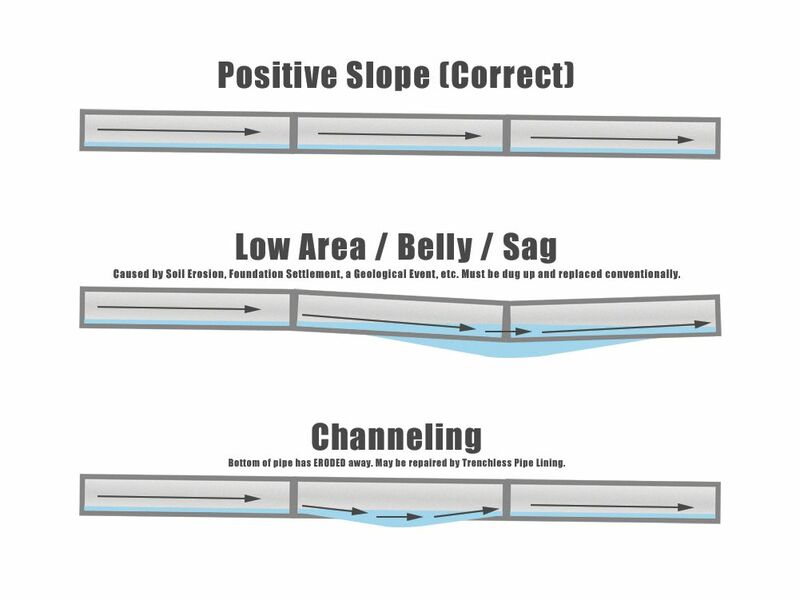 What is a Sewer Line Belly, Sag or Low Area? A sewer line belly, sag, or low area, can be identified by a pipe holding water after flow has stopped AND other causes of pooling water such as debris build up and channeling have been ruled out. Sewer line bellies or low areas become problems when debris collects and causes a blockage or backup. A belly in a sewer line, sag, or low area is often caused by geological events such as soil erosion, foundation settlement, earthquakes or by human error such as poor soil compaction or poor installation. More often than not a belly or low area will occur at the fitting as compared to a bend in the middle of a solid pipe, as cast iron would require immense pressure in order to bend, which just doesn’t happen especially here in South Florida where earthquakes are not a factor. So what about repairing a sewer line belly? If the possibility of sewer line channeling has been ruled out then unfortunately the only way to repair a sewer line belly, sag, low area, or back-pitch would be conventional replacement of the affected section(s) of pipe in order to reinstate proper slope. Sewer line channeling occurs when running water cuts a course into the bottom of a sewer line over time similar to the formation of a ravine, canyon or gully. In many cases, by the time a sewer line channel has become a problem, the bottom of the pipe may be completely GONE. Such a vulnerability provides an access point for tree roots and insects, which may make their way into your home. Channeling is one of the most common sewer problems in horizontal cast iron pipes that we come across at Pipelining Technologies. If after reviewing this article you find that your sewer line is channeled and not bellied, then you may be a candidate for trenchless pipelining. Since a channeled pipe does not necessarily have an issue with slope, pipelining may be the solution you are looking for. Pipelining is a non-destructive, cost-effective, and environmentally friendly method of repairing a damaged pipe from the inside by means of inserting an epoxy saturated felt liner into the pipe and letting it cure in place. What that means for you is no digging up your floors or destruction inside your home to repair your sanitary drainage pipes. You won’t even need to leave your home during repairs. The result is a brand new, PVC quality pipe within the old one with a manufacturer’s 50 year life use expectancy. Above is a picture of a horizontal cast iron pipe with channeling. Notice that the bottom of the pipe is completely gone due to erosion. Channeled sewer lines can be repaired by means of trenchless pipe lining. No digging necessary. Sewer Line Belly vs. Channeling – Why the confusion? The issue lies with the company performing the video inspection. At first glance, both conditions may have the same symptom – the camera going underwater during a sewer video inspection. However, only after thorough investigation with a jetter can the problem be properly diagnosed. In conclusion, a belly in a sewer line and channeling are easily confused. We have found that when our customers mention they have a belly in their sewer line, 99% of the time the line is channeled instead. Since a sewer line belly is accompanied by an issue with the pipe’s slope, conventional replacement is the only repair option. However, channeling differs in that the pipe’s slope (in most cases) remains functional. This means that channeling may be repaired by trenchless pipelining, saving you time, money, headaches and the mess associated with conventional replacement. If you would like more information about whether trenchless pipelining is right for you, please feel free to contact us. Should You Tunnel Under Your Foundation To Replace Pipes? Pipe lining won’t fix a pitch issue. If it is truly back pitched then it may need to be replaced. A video inspection will help determine if the pipe is poorly pitched or if it is just scaled. Board Members: Are You Forgetting Something in Your 2019 budget?